A good short story explores one idea and engages all the readerâ€™s senses. Anyone wanting to become a short story writer should look at the way an expert constructs their fiction. A fine example of such an author is Leigh Kennedy. Each of the fifteen stories in this volume do exactly what they set out to do. Each one is a small gem. Contemporary short stories have an advantage over genre ones in that the reader is familiar with the background and little needs explaining leaving the tale itself to ensnare the reader in its wiles. Those written by Kennedy start in ordinary ways and subtly change. The first in the volume, â€œBatsâ€, starts as a strange incident with a bat flying through the bedroom window â€“ followed by others. By the end both you and the narrator know that something creepy is going on. â€œVulture Trucksâ€ could be set in any mid-American small town but the female tow-truck driver owes her success to her prescience. 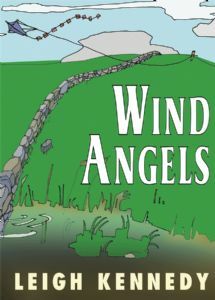 Some have a very definite SF theme such as the title story, â€œWind Angelsâ€, which is set in a flooded future. â€œHelen, Whose Face Launched Twenty-eight Contestoga Hovercraftâ€ is set on an artificial habitat in Earth orbit and â€œBelling Marthaâ€ is set in a future that has entered another ice age due to the eruption of three massive volcanoes. In each of these, the information needed to understand the setting is dropped in gently, the focus being on the interactions between the characters. These demonstrate the sure touch of Kennedyâ€™s subtle hand and the way stories like this should be written. Horror can feature as part of a story depending on the traumas the author decides to put their characters through. Several stories here deal with grief. â€œTropismâ€ deals with the situation of a wife exhuming her dead husband because she believes that he is not fully dead while â€œThe Preservation of Lindyâ€ is a 3D walk-in image of a dead daughter. â€œVidaâ€ has grief at its heart when, after fleeing from seeing her stepfather kill her mother, Vida finds a strange sanctuary. Yet there is also fantasy here, as in â€œThe Ineffableâ€ where a nettle fairy is working in a hospital netting souls and catches a very rare one. If there is any secret to Kennedyâ€™s ability to write exceptional stories it is that she is able to take and follow through one idea and refuses to get bogged down with the side issues that rightly belong in novels. Also she doesnâ€™t allow genre labels to restrict her. If the idea demands elements from several genres, it gets them. If you have never read any of Kennedyâ€™s stories, buy this book and find out how it should be done.